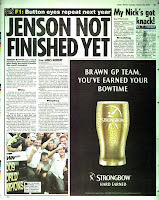 Jenson Button has finally become Forumla One world champion and by gum have the Brawn GP team earned their Bowtime. So we decided to tell them, placing ads in the Daily Mirror, Star and Sun. Sorry ladies - its official, he's off the market! mmmm How Divine! It's Chocolate week! Can you imagine British kids doing this? ?